1. Dishing Up The Dirt: One of my favorite food blogs! They own a farm and I just love the seasonal meals they create and reading about their farm. It makes me wish we could have a garden at least! One day when we aren't in an apartment. My favorite meal we've made from Dishing Up The Dirt is the zoodles with chickpea meatballs. Also love Iowa Girl Eats, Lexi's Clean Kitchen, The Skinny Fork and Oh My Veggies. 2. Girl Lost In the City: I love this blog. I guess it's considered a ~lifestyle~ blog and I love the variety of topics she posts on! Plus she's a reader! I always find something that resonates with me or interests me! 3. Young Adventuress: On my own blog I'm doing a whole list of my favorite travel blogs for this topic today but figured I would include one of my favorites on this list, too! I've been reading her blog for several years and love how honest and straightforward she is. She keeps it real whether she's talking about the downsides of travel or the best hate mail/comments she's gotten. She even has a category labeled "this will probably get me hatemail." I don't always agree with necessarily everything she ever says but I always respect her honesty and her opinions and she makes me laugh and want to see the world. 4. Kendi Everyday: I don't follow a ton of fashion bloggers anymore because I typically get outfit inspo from Twitter these days or just playing around in my closet but Kendi's blog is one of the few fashion blogs I've kept in my reader! Another one is Girl Meets Glam! 5. Adventurous Kate: Love this travel blog! It's so fun reading about all of Kate's travels as a single woman. 6. 320 Sycamore: This is pretty much a DIY home decor site that is really fun to waste time on dreaming about my own future home! 7. Hostess with the Mostess Blog: An entertainment blog! I love looking at her party planning ideas. 8. Design Seeds: All the pretty color combinations ever, pulled from beautiful photos. 9. Chocolate Covered Katie: Healthy dessert recipes! 10. The Beauty Department: A blog with all kinds of beauty tips and tutorials. Tell us your favorite non-bookish websites! 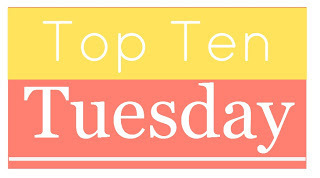 I love food blogs, that's what I did on my top ten today! I'll have to check out Dishing up the dirt! The Young Adventuress website sounds really interesting, I'll have to check it out. All those websites sound so neat! I'll definitely need to check them out! Thanks!